“The Parker Jewish Institute for Health Care and Rehabilitation residents expressed to me how much they appreciated your visit and how sensational the music was. 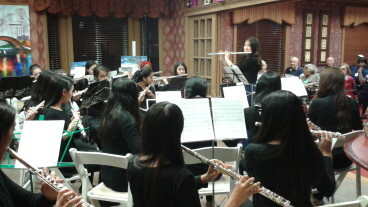 Our Nassau String Orchestra performed a wide variety of exhilarating classical music at the Port Washington Children’s Center on Thursday, April 11, 2019 led by Director Michelina Sobolewski. 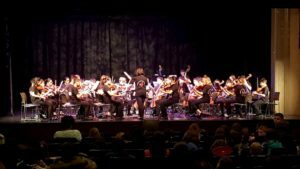 Kindergarten through 6th grade children, many of them young musicians-in-the-making, were introduced to the string orchestra and given the opportunity to accompany them with a rainstick and ask questions about the music and the instruments being played. They were also treated to a conductor-less performance of Mozart’s Eine kleine Nachtmusik. MYO Members and Music Directors shared the joy of food and music with approximately 50 student guests during this year’s Bring a Friend Night. The night consisted of sight reading new music, rehearsing current music with the guests, and feasting on a large assortment of desserts. 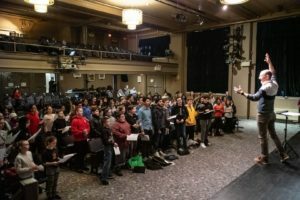 MYO held our first ever One SINGular Sunday on Sunday, February 10, 2019 at the Landmark on Main Street for 107 participating singers. Singers ages 8 – 18 rehearsed and performed in a one-day choir led by Dr. David Fryling, and attended workshops on Mindfulness with Andrea Gonnella and Music Theater with Steven Altinel. 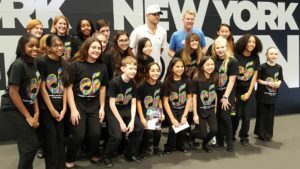 Members from across six of our MYO Choirs performed the Star-Spangled Banner at Opening Night of the New York Open (tennis) at the Nassau Veterans Memorial Coliseum on Saturday, February 9, 2019, led by Director Doreen Fryling. Their performance was followed by a meet and greet with tennis stars Andy Roddick and Jim Courier. 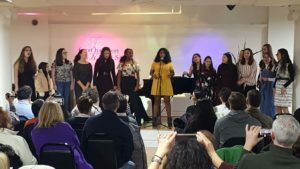 Members of our Nassau Symphonic Choir performed solos, duets, a trio, and a grand finale of Seasons of Love from Rent for their Coffeehouse held at Faust Harrison Pianos in Huntington Station on Friday, January 25, 2019. The event was organized by Music Director Louise O’Hanlon, several singers were accompanied by Pianist Kenneth Zagare, and the audience provided generous donations for Island Harvest. 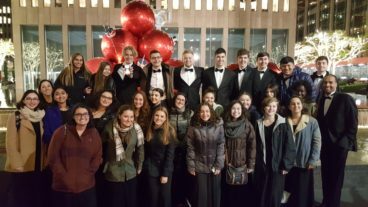 The Suffolk Concert Choir, led by Director Melanie Dominick and Pianist Brendan Sparks, performed patriotic songs, holiday songs, and music from their November 11 Tilles Center concert for the residents of the Long Island State Veterans Home on Thursday, December 20, 2018. The Veterans sang along with our choir members and helped us all welcome the holiday season. Nassau Chamber Chorale Returns to Radio City Music Hall! Members of the Nassau Chamber Chorale, led by Director Edward Norris, returned to Radio City Music Hall to sing O Come, All Ye Faithful and Carol of the Bells before the Christmas Spectacular Starring the Radio City Rockettes on Monday, November 19, 2018. 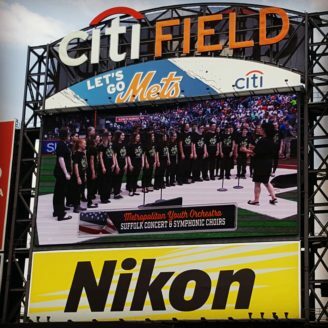 Members of our Suffolk Concert and Symphonic Choirs performed the Star-Spangled Banner at the New York Mets game at Citi Field on Sunday, June 24, 2018, led by Director Shoshana Hershkowitz! 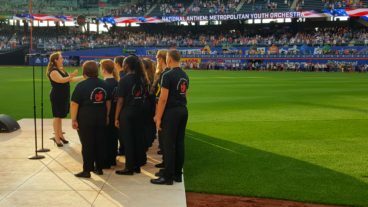 Members of our Nassau and Suffolk Treble Choirs performed the Star-Spangled Banner at the New York Mets game at Citi Field on Friday, June 22, 2018, led by Director Craig Knapp! 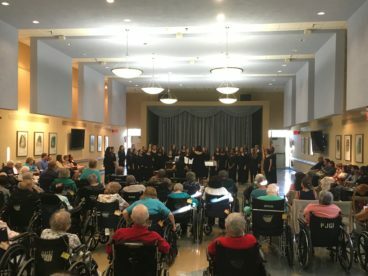 Members of the Nassau Concert Choir performed a community concert for the residents of the Parker Jewish Institute for Health Care and Rehabilitation in New Hyde Park on Tuesday, May 22, 2018, led by Director Doreen Fryling with Pianist Jeong-Hwa Park. The Concert Choir members gave lively introductions to each piece they performed and were very warmly received by the audience of residents and their family members. 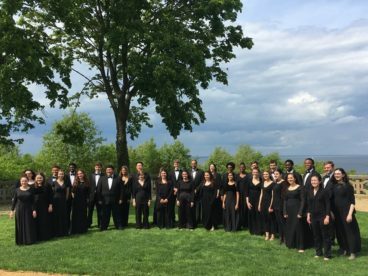 The Nassau Chamber Chorale was invited to perform a free community concert at Hempstead House on the Sands Point Preserve Sunday, May 20, 2018, led by Director Edward P. Norris III and Pianist Cara Brown. MYO Member Michael Desir conducted the Chorale in All My Trials arr. Stacey Gibbs to a standing ovation! 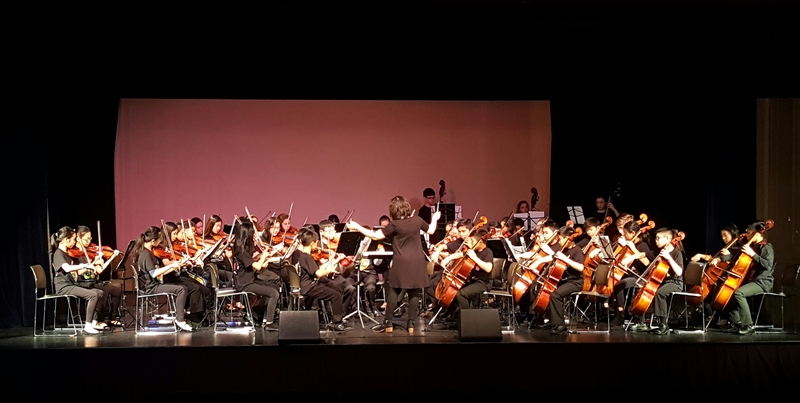 The concert featured repertoire from the 2017-2018 season and included guest string performers Adam Birke, Jess Block, Catherine Fish, Brianne Lugo, and Caroline Shyr. Members of the Nassau Concert and Symphonic Choirs performed the National Anthem (in the rain!) for the New York City Football Club at Yankee Stadium, led by Director Louise O’Hanlon on Saturday, May 19, 2018. 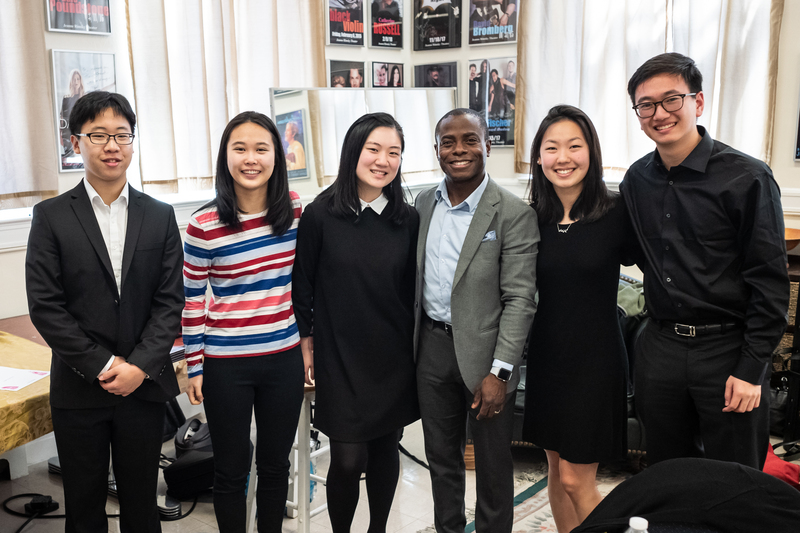 MYO held our first ever Clarinet Day on Sunday, April 22, 2018 at the Landmark on Main Street and featured MYO members Kenny Kim and Ju Young Yi in a master class with New York Philharmonic Principal Clarinetist Anthony McGill and Elin Hu and Alan Jian in a master class with Bass Clarinetist, Composer, and Arranger Michael Lowenstern. 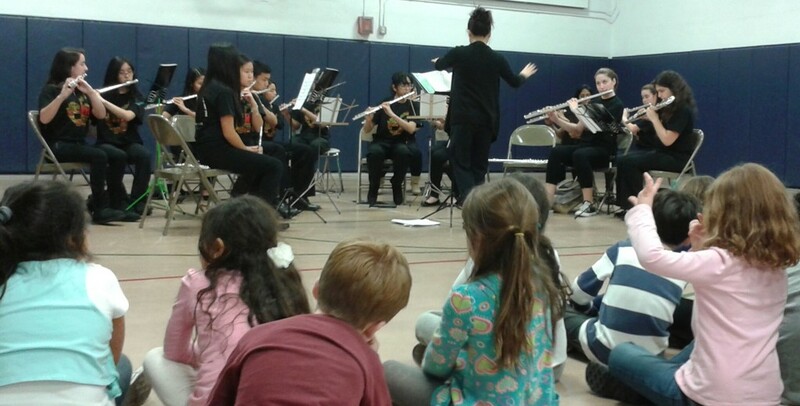 The Nassau String Orchestra performed a wide variety of exciting classical music for the Port Washington Children’s Center on Thursday, April 19, 2018 led by Director Michelina Sobolewski. 3rd through 6th grade children in the audience were introduced to the string family and given the opportunity to ask and answer questions about the music and the instruments. 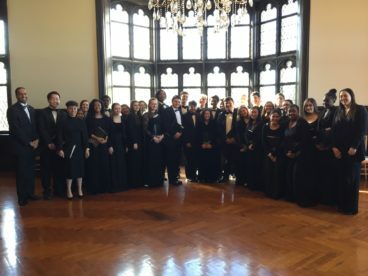 Members of the Nassau Symphonic Choir, led by Director Louise O’Hanlon, performed Bernstein’s Simple Song and Make Our Garden Grow with the American Chamber Ensemble and singers from Hofstra University (including MYO Alum Laurence Plonsky) in the Helene Fortunoff Theater on Sunday, April 8, 2018. The concert also featured special guest clarinetist and living legend Stanley Drucker performing the Brahms Trio and Bernstein Sonata and discussing the life and music of Leonard Bernstein. 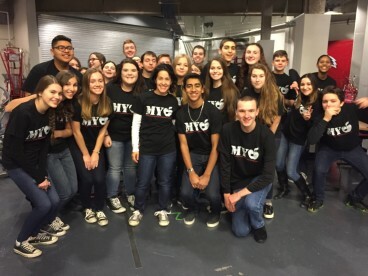 Members of our Nassau Concert Choir performed the Star-Spangled Banner at Opening Night of the New York Open (tennis) at the newly renovated Nassau Veterans Memorial Coliseum on Sunday, February 11, 2018, led by Director Doreen Fryling. Members of our Suffolk Concert Choir performed the Star-Spangled Banner at the Stony Brook Seawolves men’s basketball game at the Island Federal Credit Union Arena, Stony Brook University on Saturday, February 3, 2018, led by Director Melanie Dominick. 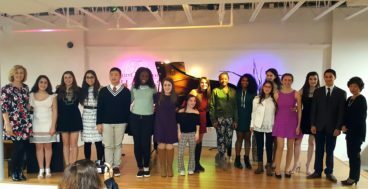 Members of our Nassau Symphonic Choir performed solos and duets for MYO’s very first Coffeehouse held at Faust Harrison Pianos in Huntington Station on Friday, January 26, 2018. The event was organized by Music Director Louise O’Hanlon, several singers were accompanied by Pianist Naomi Aomori, and the audience provided generous donations for Island Harvest. 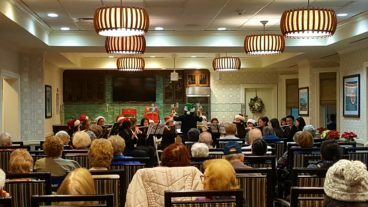 The Suffolk Concert Choir, led by Director Melanie Dominick and Pianist Brendan Sparks, performed patriotic songs, holiday songs, and more for the residents of the Long Island State Veterans Home on Tuesday, December 19, 2017. The veterans sang their favorite holiday songs along with our choir members and put us all in a festive mood. The Nassau Flute Choir, led by Director Nana Aomori, performed a wide variety of duets, trios, quartets, and holiday tunes for The Bristal Assisted Living residents on Monday, December 11, 2017. Radio City Music Hall debut for the Nassau Chamber Chorale! 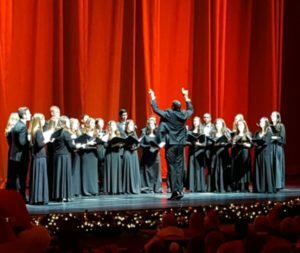 Members of the Nassau Chamber Chorale, led by Director Edward Norris, made their debut at Radio City Music Hall singing Silent Night and Angels We Have Heard On High at the Christmas Spectacular Starring the Radio City Rockettes on Monday, November 20, 2017. 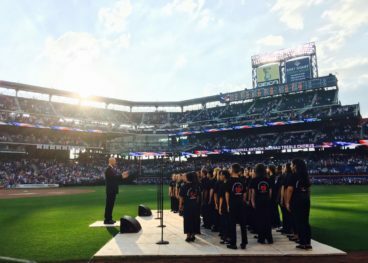 Members of our Suffolk Concert Choir performed the Star-Spangled Banner at the New York Mets game at Citi Field on Saturday, July 15, 2017, led by Director Melanie Dominick! The Mets won 9 – 3 against the Colorado Rockies! 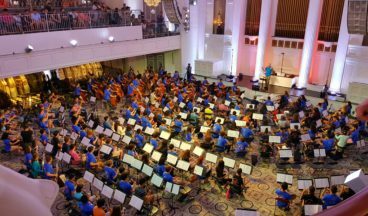 41 of our MYO members from across our orchestras and flute choir participated in Carnegie Hall’s National Youth Orchestras Side-by-Side event on Saturday, July 15, 2017 in Manhattan! See if you can spot the MYO t-shirts in the photo! 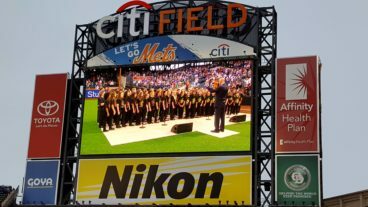 Members of our Nassau and Suffolk Treble Choirs performed the Star-Spangled Banner at the New York Mets game at Citi Field on Friday, June 16, 2017, led by Director Craig Knapp. Madison Square Garden debut for the Nassau Concert Choir! 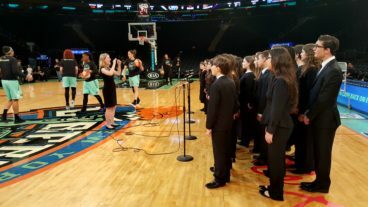 Members of the Nassau Concert Choir, led by Director Doreen Fryling, made their debut at Madison Square Garden singing the National Anthem at the New York Liberty Basketball game on Sunday, June 4, 2017. 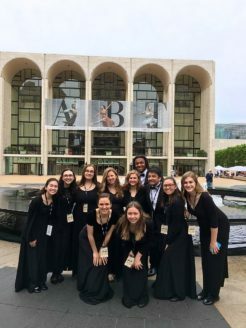 Members of the Nassau Chamber Chorale, coached by Director Edward Norris, performed the music of Ola Gjeilo in David Geffen Hall at Lincoln Center as part of Distinguished Concerts International New York’s (DCINY) event on Sunday, June 4, 2017. The performance was conducted by Dr. James M. Meaders, with the composer himself, Ola Gjeilo, playing the piano. 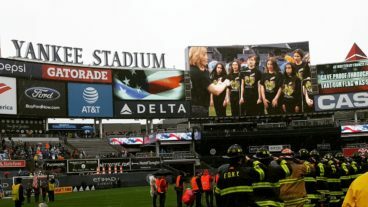 Members of the Suffolk Youth Chorale led by Director Shoshana Hershkowitz made MYO’s Yankee Stadium debut singing the National Anthem at the New York City Football Club game on Saturday, June 3, 2017. 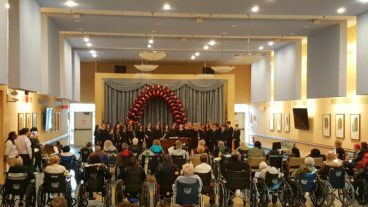 Members of our Nassau Concert Choir performed a rousing community concert for the residents of the Parker Jewish Institute for Health Care and Rehabilitation in New Hyde Park on Tuesday, May 23, 2017, led by Director Doreen Fryling with Pianist Jeong-Hwa Park. The Concert Choir members took turns introducing each piece of music and talked about why it was their favorite. Our Nassau String Orchestra introduced and performed a wide variety of exciting classical music by Handel, Vaughan-Williams, Eric Whitacre, and more at the Port Washington Children’s Center on Thursday, April 20, 2017 led by Director Michelina Sobolewski. 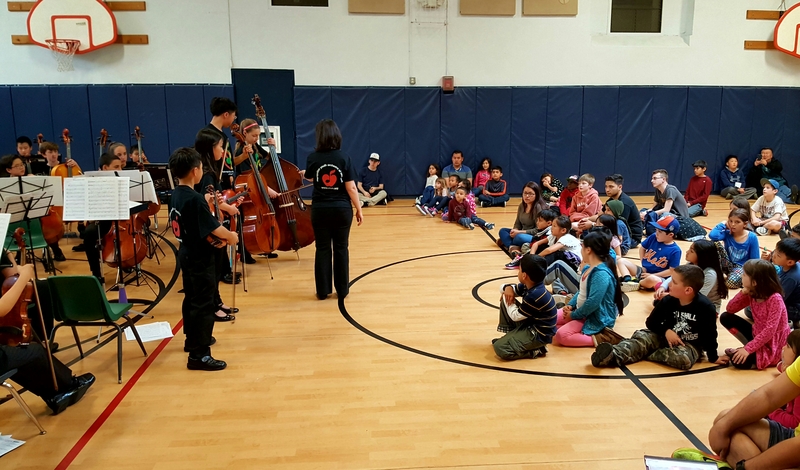 80 children, in Kindergarten through 6th grade, were introduced to the string orchestra and given the opportunity to ask questions about the music and the instruments being played. 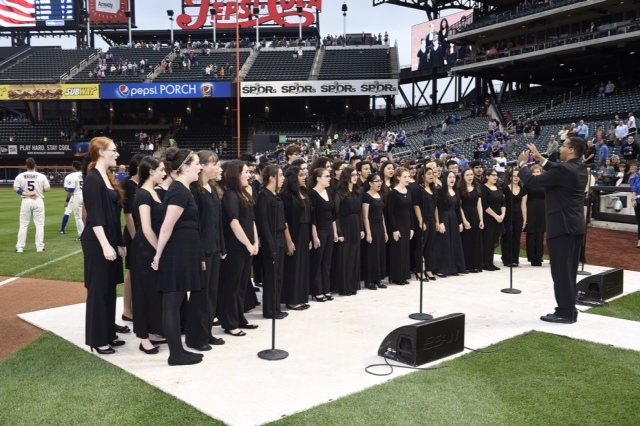 Members of our Nassau Symphonic Choir performed the Star-Spangled Banner at the New York Mets game at Citi Field on Thursday, April 6, 2017, led by Director Louise O’Hanlon. 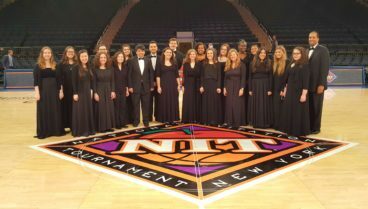 Members of our Nassau Chamber Chorale performed the Star-Spangled Banner at the National Invitation Tournament College Basketball Semifinals at Madison Square Garden in New York City on Tuesday, March 28, 2017, led by Director Edward P. Norris III. Members of our Nassau Chamber Chorale performed for the annual Winter Choral Concert held at Hempstead House on the Sands Point Preserve on Sunday, March 5, 2017, led by Director Edward P. Norris III and Pianist Cara Brown. The concert also featured the Chancel Choir of United Methodist Church, Choir of Our Savior’s Lutheran Church, Saint Stephens Episcopal Church, and The Community Synagogue Choir. 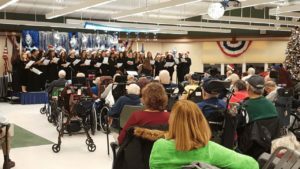 The Suffolk Concert Choir, led by Director Melanie Dominick and Pianist Doreen Fryling, performed a variety of patriotic songs, holiday songs, and more for the Long Island State Veterans Home residents on Tuesday, December 20, 2016. The veterans sang along with our choir members in a wonderfully moving performance of God Bless America. The Nassau Flute Choir, led by Director Nana Aomori, performed a wide variety of musical selections and introduced the flute family to The Bristal Assisted Living residents on Monday, December 12, 2016. MYO Violinists Evan Cheng, Gilda DelBianco, Theresa Jiao, Annie Lin, Emily Morris, Ashley Smith, Katlyn Smith, and Alexandra Woroniecka performed Beethoven’s 5 Secrets with The Piano Guys in Colden Auditorium at Queens College on Friday, December 2, 2016. 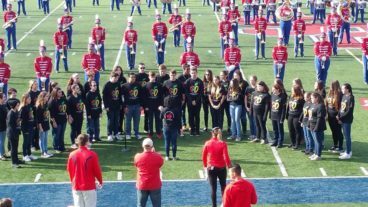 Members of our Suffolk Youth Chorale performed the Star-Spangled Banner at the Stony Brook Seawolves football game at Kenneth P. LaValle Stadium, Stony Brook University on Saturday, November 5, 2016, led by Director Shoshana Hershkowitz. 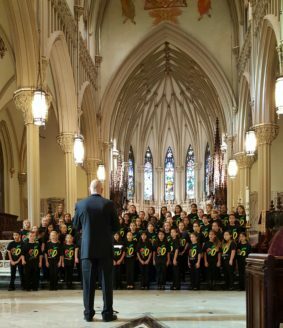 Members of our Nassau Treble Choir performed for the Fall Conference of the New York Chapter of the American Choral Directors Association (ACDA) at the Cathedral of the Incarnation on Saturday, November 5, 2016, led by Director Craig Knapp. 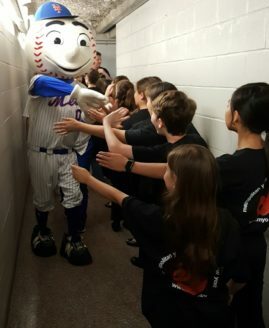 Members of our Suffolk Concert Choir performed the Star-Spangled Banner at the New York Mets game at Citi Field on Sunday, July 31, 2016, led by Director Melanie Dominick, and they got to meet Mr. Met! 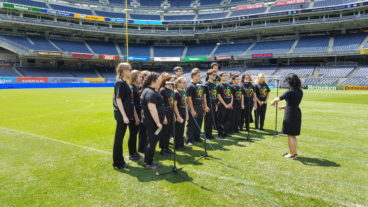 Members of our Nassau Treble Choir performed the Star-Spangled Banner at the New York Mets game at Citi Field on Tuesday, June 21, 2016, led by Director Craig Knapp. 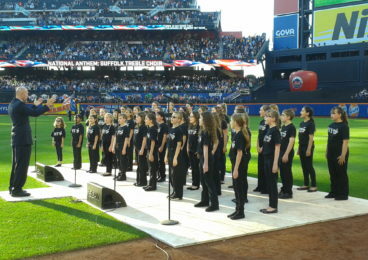 Members of our Suffolk Treble Choir performed the Star-Spangled Banner at the New York Mets game at Citi Field on Friday, June 17, 2016, led by Director Craig Knapp. 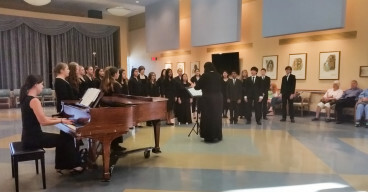 Members of our Nassau Concert Choir performed at the Parker Jewish Institute for Health Care and Rehabilitation in New Hyde Park on Tuesday, May 31, 2016, led by Director Erica Purrone with Pianist Jeong-Hwa Park. This was a performance for the residents as well as the families of the choir members involved. 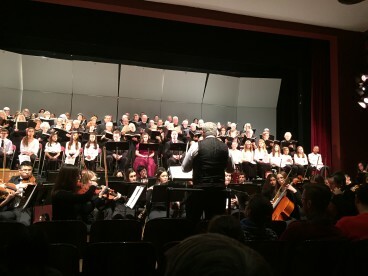 Members of our Nassau Treble Choir and Nassau Principal Orchestra performed Orff’s Carmina Burana with the North Shore Community Chorus at North Shore High School in Glen Head, NY on Saturday, April 9, 2016, led by Director Stephen Goldstein. Nassau Chamber Chorale Members sing at Madison Square Garden! 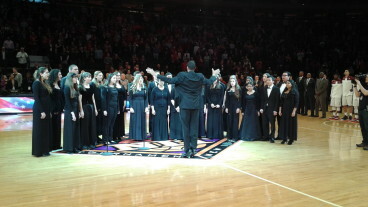 Members of our Nassau Chamber Chorale performed the Star-Spangled Banner at the National Invitation Tournament College Basketball Championships at Madison Square Garden in New York City on Thursday, March 31, 2016, led by Director Edward P. Norris III. 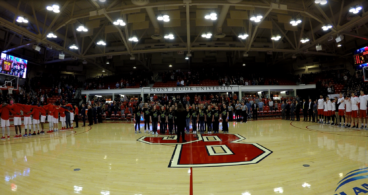 Members of our Suffolk Youth Chorale performed the Star-Spangled Banner at the Stony Brook Seawolves women’s basketball game at the Island Federal Credit Union Arena, Stony Brook University on Thursday, February 11, 2016, led by Director Shoshana Hershkowitz. 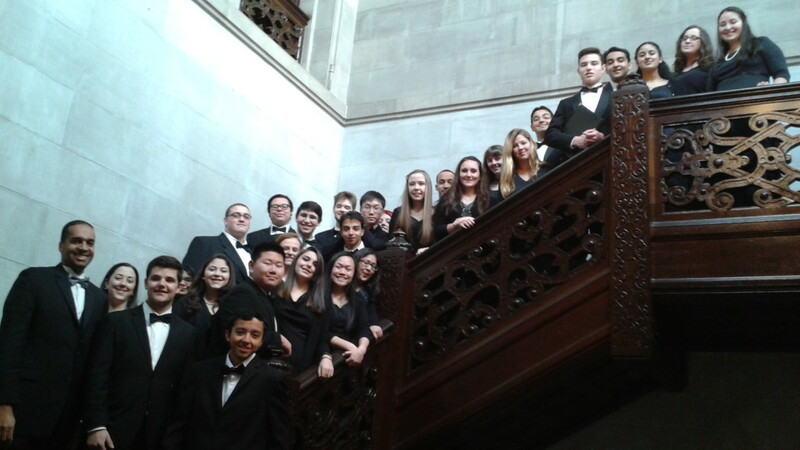 Members of our Nassau Symphonic Choir performed for the annual Winter Choral Concert held at Hempstead House on the Sands Point Preserve on Sunday, January 10, 2016, led by Director Louise O’Hanlon and Pianist Naomi Aomori. The concert also featured choirs from the Community Synagogue, the United Methodist Church of Port Washington, the St. Stephen’s Episcopal Church, and the Lutheran Church of Our Savior. The Nassau Flute Choir, led by Director Nana Aomori, performed holiday songs and introduced the flute family to The Bristal’s resident seniors on Monday, December 14, 2015. 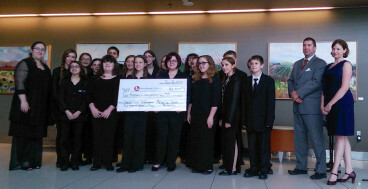 Members of our Suffolk Concert Choir performed at the Stony Brook Hospital in Stony Brook, NY on Tuesday, June 16, 2015, led by Director Melanie Dominick with Pianist Brendan Sparks. 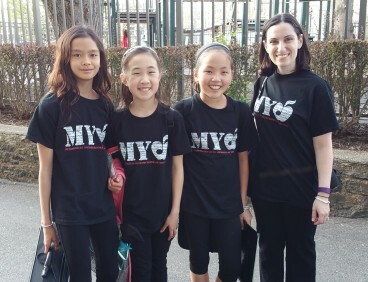 This performance was dedicated to the memory of MYO Member Veronica Franco (2001-2014) and followed a check presentation to the new Stony Brook Children’s Hospital from MYO. 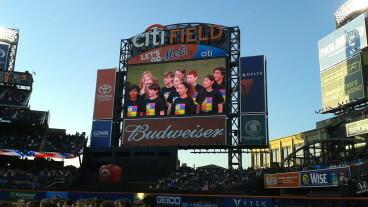 Members of our Suffolk Youth Chorale performed the Star-Spangled Banner at the New York Mets game at Citi Field on Saturday, June 13, 2015, led by Director Shoshana Hershkowitz. 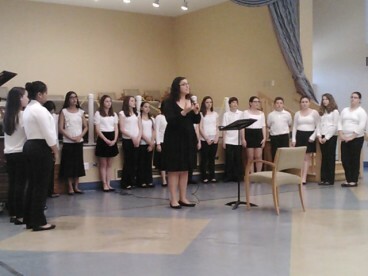 Members of our Nassau Concert Choir performed at the Parker Jewish Institute for Health Care and Rehabilitation in New Hyde Park on Tuesday, June 9, 2015, led by Director Erica Purrone with Pianist Jessalyn Christen. This was a performance for the residents as well as the families of the choir members involved. Members of our Nassau Flute Choir performed light classics on Monday, May 11, 2015, led by Director Nana Aomori. A full house of resident seniors attended the concert and were introduced to the flute family, including the piccolo, flute, alto and bass flutes. 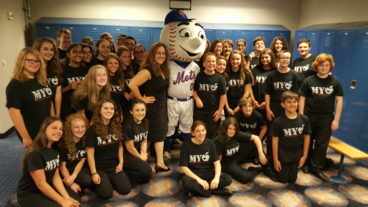 Members of our Nassau Concert Choir performed the Star-Spangled Banner at the New York Mets game at Citi Field on Saturday, May 2, 2015, led by Director Erica Purrone. Members of our Nassau Principal Orchestra performed Haydn’s The Seasons with the North Shore Community Chorus at North Shore High School in Glen Head, NY on Saturday, April 18, 2015, led by Director Stephen Goldstein. 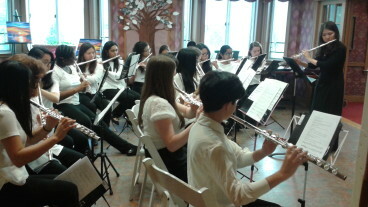 The program also included a performance of Mendelssohn’s Ruy Blas Overture, led by MYO Director Scott Stickley. 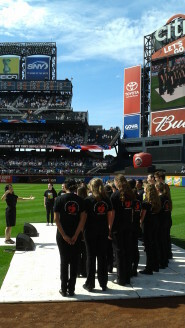 Nassau Chamber Chorale Members make their Madison Square Garden debut! 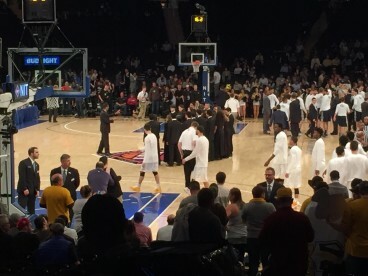 Members of our Nassau Chamber Chorale performed the Star-Spangled Banner at the National Invitation Tournament College Basketball Semifinals at Madison Square Garden in New York City on Tuesday, March 31, 2015, led by Director Edward P. Norris III. 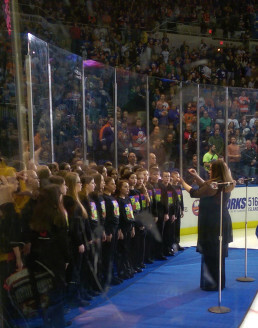 Members of our Nassau Symphonic Choir performed the Star-Spangled Banner at the New York Islanders game at Nassau Coliseum in Hempstead on Sunday, March 29, 2015, led by Director Louise O’Hanlon, right next to Islanders goalie Jaroslav Halák. 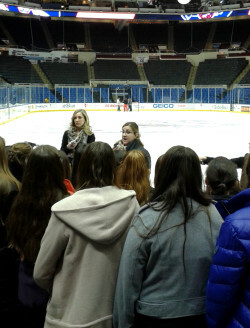 Members of our Suffolk Concert Choir performed the Star-Spangled Banner at the New York Islanders game at Nassau Coliseum in Hempstead on Monday, January 19, 2015, led by Director Melanie Dominick. 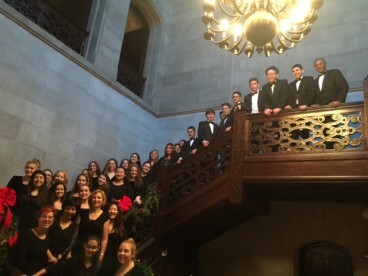 Members of our Nassau Chamber Chorale performed for the annual Winter Choral Concert held at Hempstead House on the Sands Point Preserve on Sunday, January 11, 2015, led by Director Edward P. Norris III and Pianist Cara Brown. The concert also featured the Chancel Choir of United Methodist Church, the Choir of Our Savior’s Lutheran Church, the Saint Stephens Episcopal Church, and the Community Synagogue Choir. 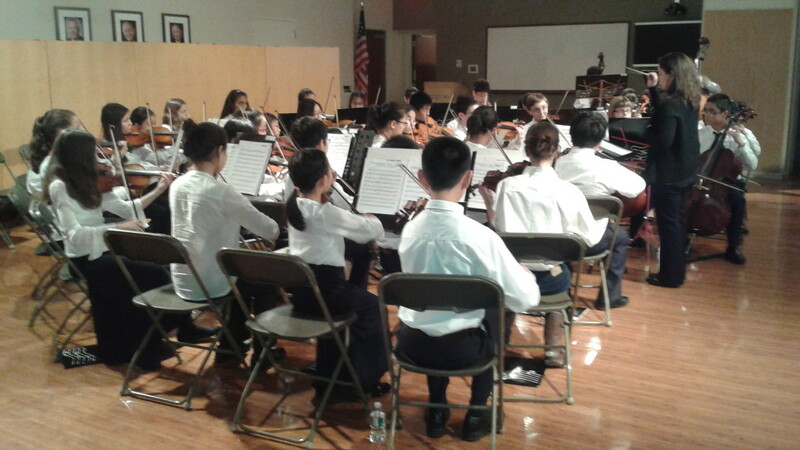 Members of our Nassau String Orchestra performed classics and holiday favorites at the Feinstein Institute in Manhasset on Tuesday, December 16, 2014, led by Director Michelina Cerbone. This was a performance for the Institute’s scientists and staff, as well as the families of the string orchestra members involved. Members of our Nassau Flute Choir performed classics and holiday favorites at the Port Washington Children’s Center on Monday, December 15, 2014, led by Director Nana Aomori. 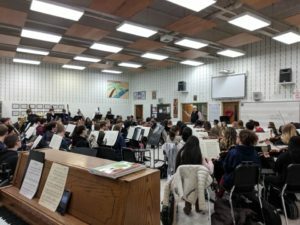 45 children, ages 5-7, attended the concert and were introduced to the flute family, including the piccolo, flute, alto and bass flutes, and were given the opportunity to try conducting. 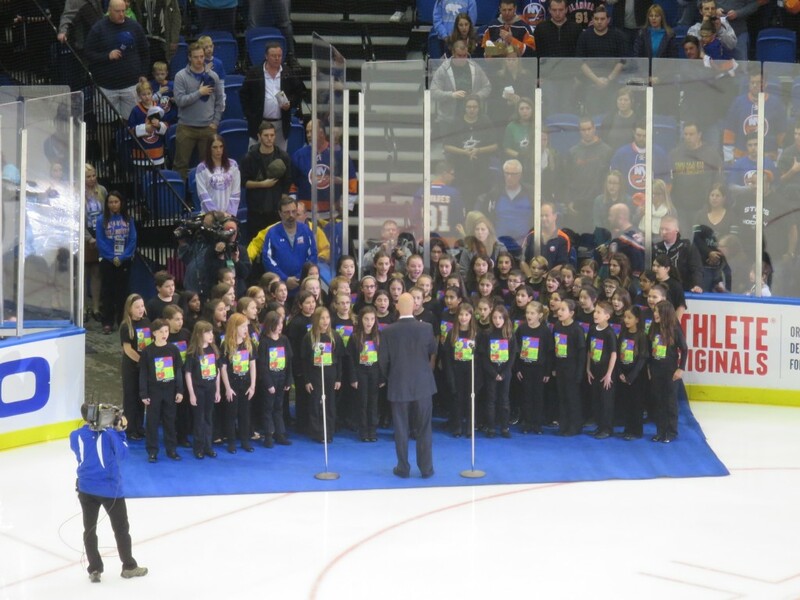 Members of our Nassau and Suffolk Treble Choirs performed O Canada and the Star-Spangled Banner at the New York Islanders game at Nassau Coliseum on Saturday, October 25, 2014, led by Director Craig Knapp. 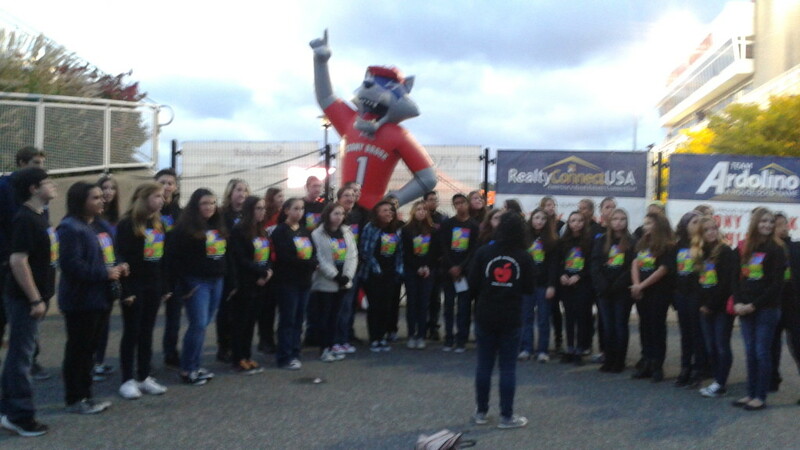 Members of our Suffolk Youth Chorale performed the Star-Spangled Banner at the Stony Brook Seawolves football game at Kenneth P. LaValle Stadium, Stony Brook University on Saturday, October 11, 2014, led by Director Shoshana Hershkowitz. 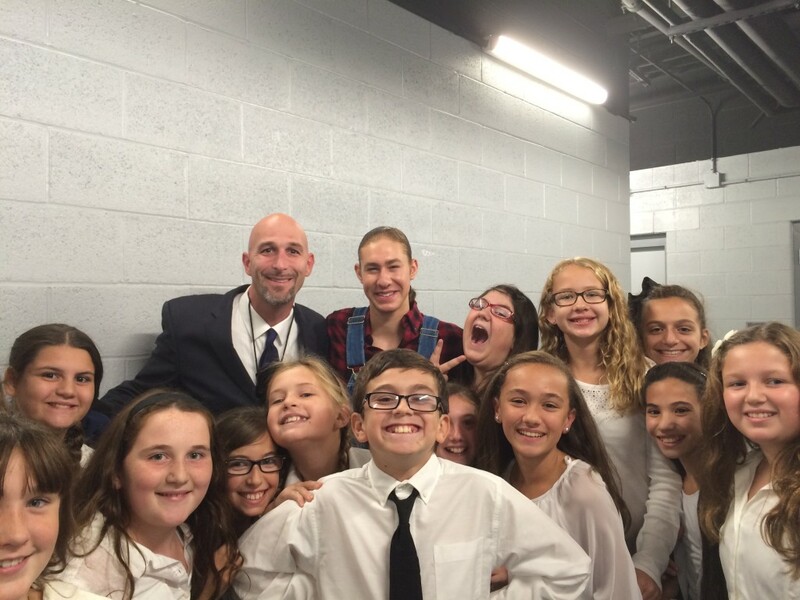 Members of our Nassau and Suffolk Treble Choirs performed for Ice Dreams, a star-studded figure skating event at Twin Rinks in Eisenhower Park on Saturday, September 20, 2014, led by Director Craig Knapp. MYO Members and Mr. Knapp pictured here with US Olympic Bronze Medalist Jason Brown. 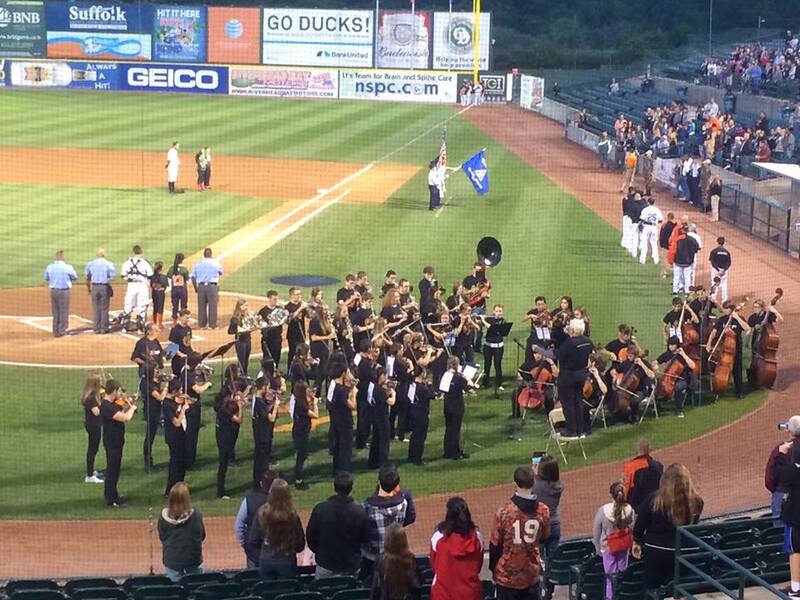 Members of our Suffolk Principal Orchestra performed the Star-Spangled Banner at the Long Island Ducks game at Bethpage Ballpark in Central Islip on Friday, September 19, 2014, arranged and led by Director Phil Preddice. 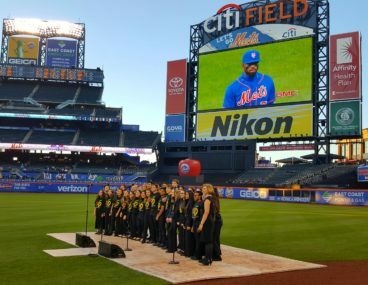 Members of our Nassau Youth Chorale performed the Star-Spangled Banner at the New York Mets game at Citi Field on Thursday, June 12, 2014, led by Director Edward P. Norris, III. 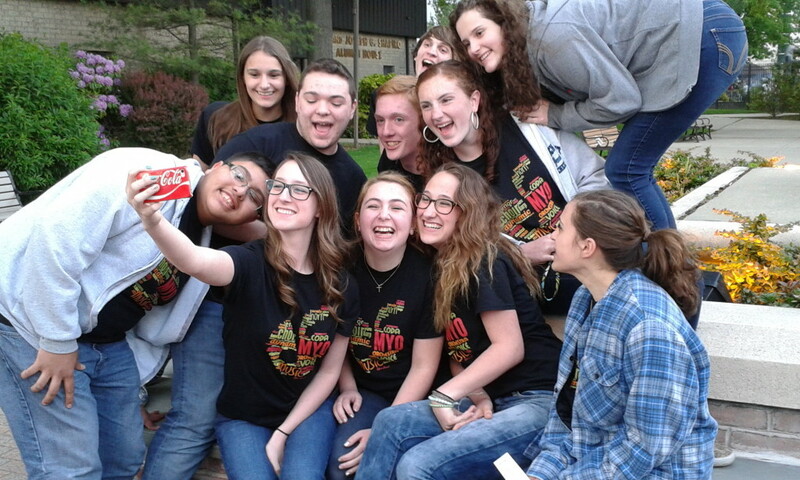 Members of our Suffolk Youth Chorale performed the Star-Spangled Banner at the New York Lizards game at Shuart Stadium, Hofstra University on Friday, May 30, 2014, led by Director Shoshana Hershkowitz. 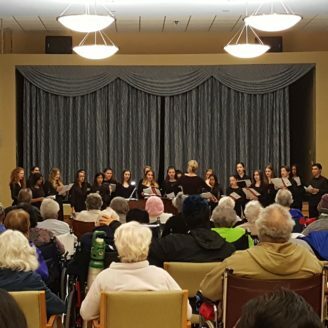 Members of our Nassau Concert Choir performed at the Parker Jewish Institute for Health Care and Rehabilitation in New Hyde Park on Tuesday, May 13, 2014, led by Director Erica Purrone with Piano Accompanist Jessalyn Christen. 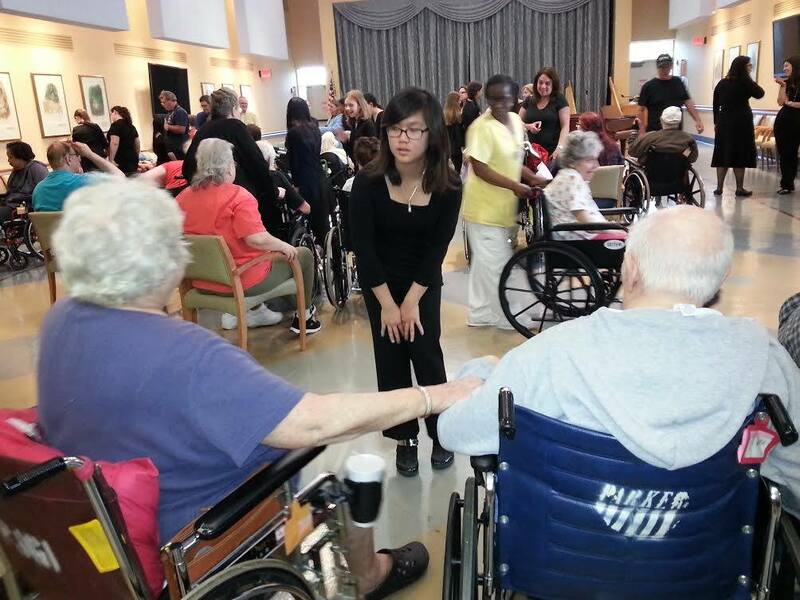 This was a performance for the residents as well as the families of the choir members involved. 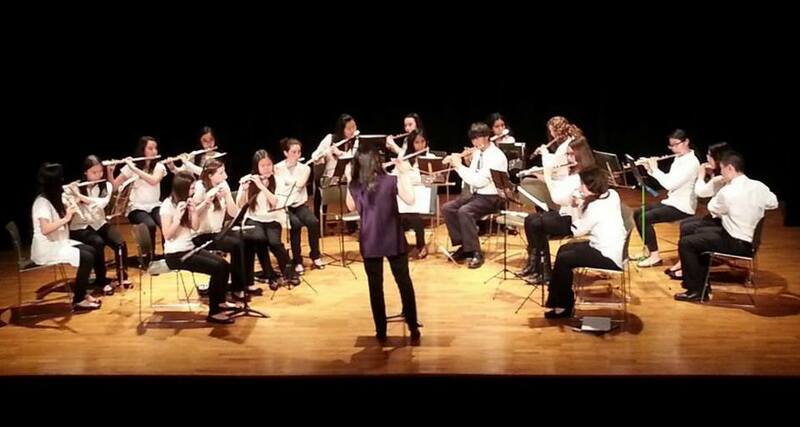 Members of our Nassau Flute Choir performed on Monday, May 5, 2014 at the Landmark Theater in Port Washington, led by Director Nana Aomori and guest artist and master class leader Kaori Fujii. 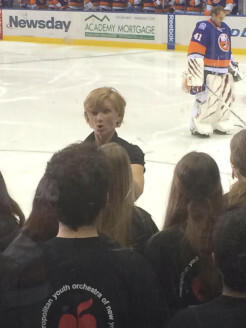 Members of our Suffolk Concert Choir performed the Star-Spangled Banner at the New York Islanders game at Nassau Coliseum in Hempstead on Saturday, January 25, 2014, led by Director Melanie Dominick. 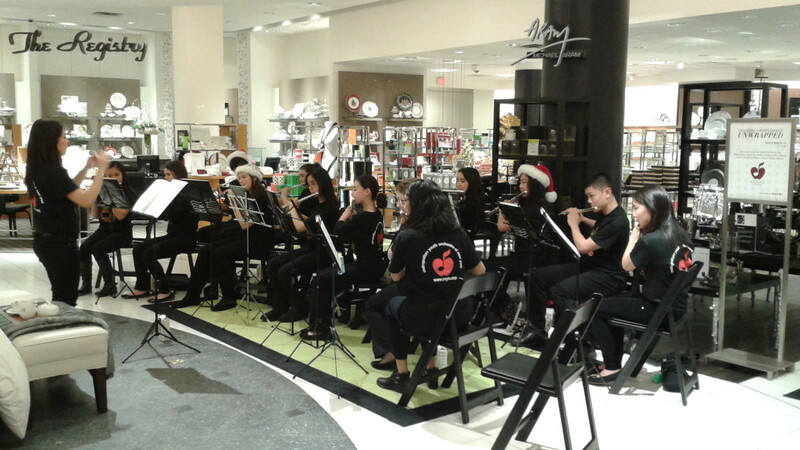 Members of our Nassau Flute Choir performed classics and holiday favorites at Bloomingdale’s in the Roosevelt Field Mall on Wednesday, December 11, 2013 for the Shopping Works Wonders fundraising event, led by Director Nana Aomori. 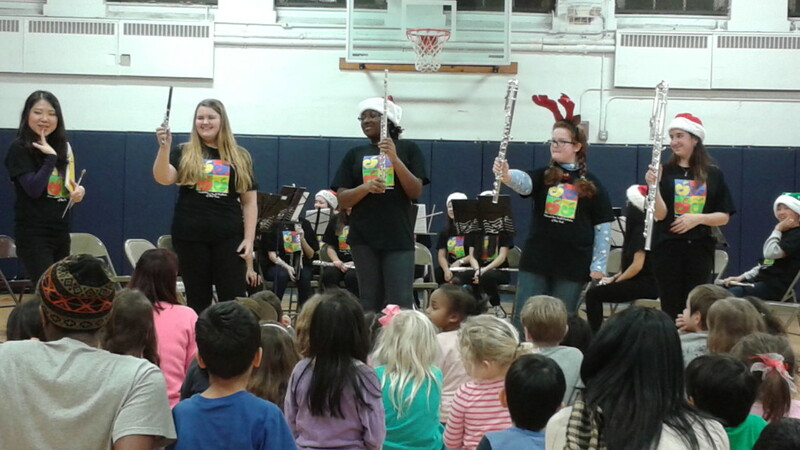 Members of our Nassau Flute Choir performed classics and holiday favorites at the Port Washington Children’s Center on Monday, December 2, 2013, led by Director Nana Aomori. 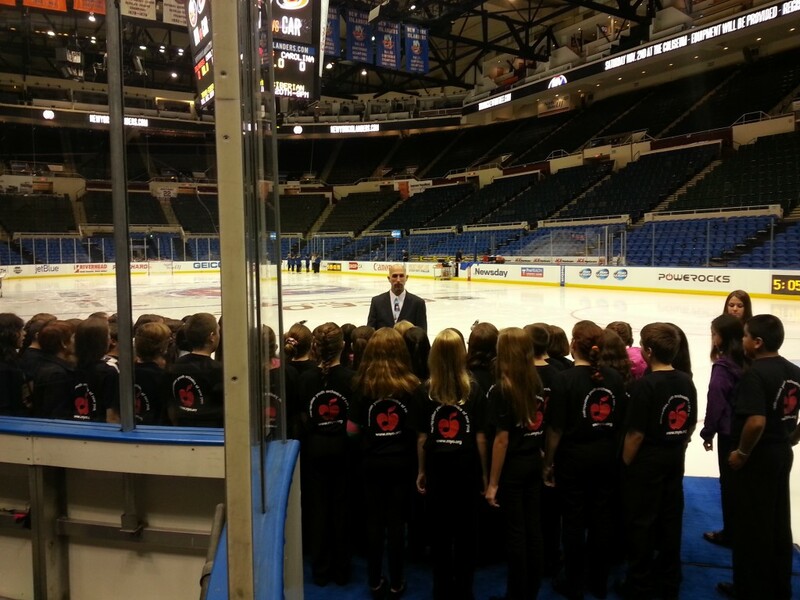 Members of our Nassau and Suffolk Treble Choirs performed the Star-Spangled Banner at the New York Islanders game at Nassau Coliseum in Hempstead on Saturday, October 19, 2013, led by Director Craig Knapp. Click HERE to view the video of the performance as posted on our Facebook page.